Happy Meatless Monday! This week Kamaal and I made a brand new video showing you how we make our seitan, plain and BBQ style. It is super simple and CHEAP! For less than $2/pound you can make your own "meat" and then add various sauces for the marinade. This recipe includes our BBQ Sauce that we make from scratch as well. 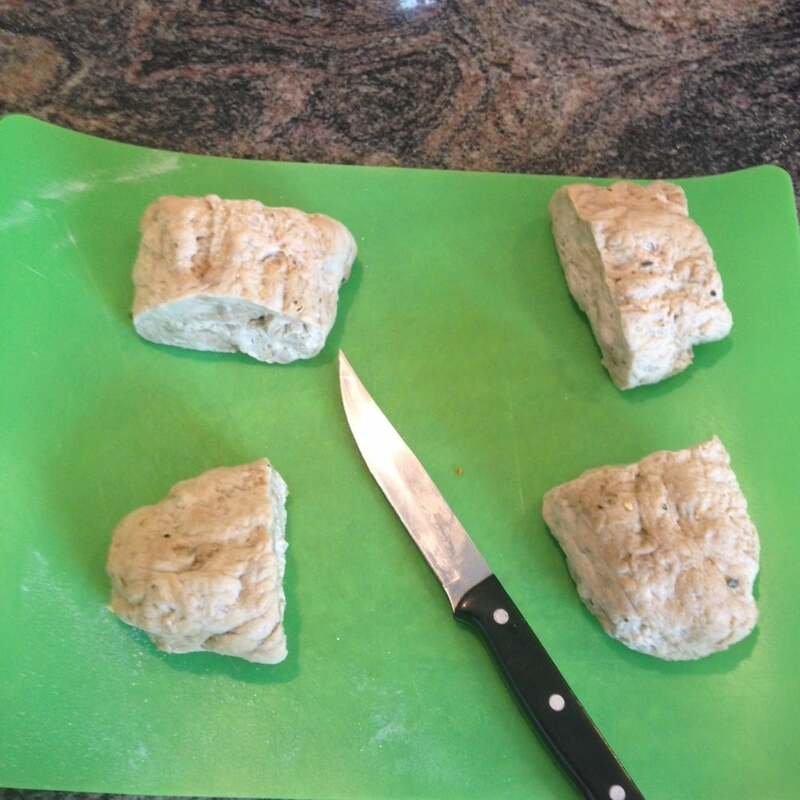 Making our own seitan was a game-changer for our family. Not only is it vastly less expensive, but we like our homemade version so much better. It's fresher, and we can add various spices to change up the flavor anytime we want. It takes a bit of time to prepare (about 1 1/2 hours including cooking time), but I HIGHLY recommend you give it a try. It's VERY EASY and lasts refrigerated for a week or so. You can make a batch once a week and just add it to your recipes as needed. We have more recipes on our site, or in our book The Vegan System. Step 1: Put 2 cups of the vital wheat gluten in a large bowl. Add Spike and garlic powder - mix together. Step 2: Add 1 3/4 cup warm water. Stir. Step 3: After the water is well mixed, remove the dough ball from the bowl. Step 4: Knead the dough for about 2 minutes and form into a roll. Step 5: Cut roll into 4 pieces and then again into smaller pieces - about 30 in total. Step 6: For the broth, bring 6 cups of water to a boil. Add the Liquid Aminos (or Soy Sauce), Molasses, vegetable bouillon and oil. Add the seitan pieces to the broth and cover - letting it return to a boil. 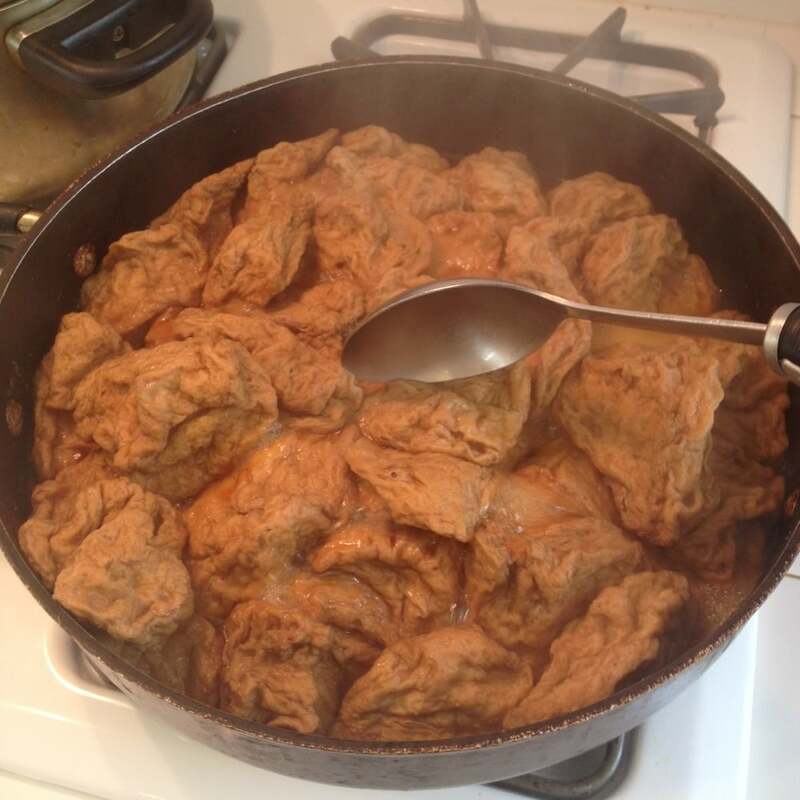 Step 7: After the broth is boiling again, the seitan will "bubble up" and become large, "fluffy" pieces, pushing against the lid. 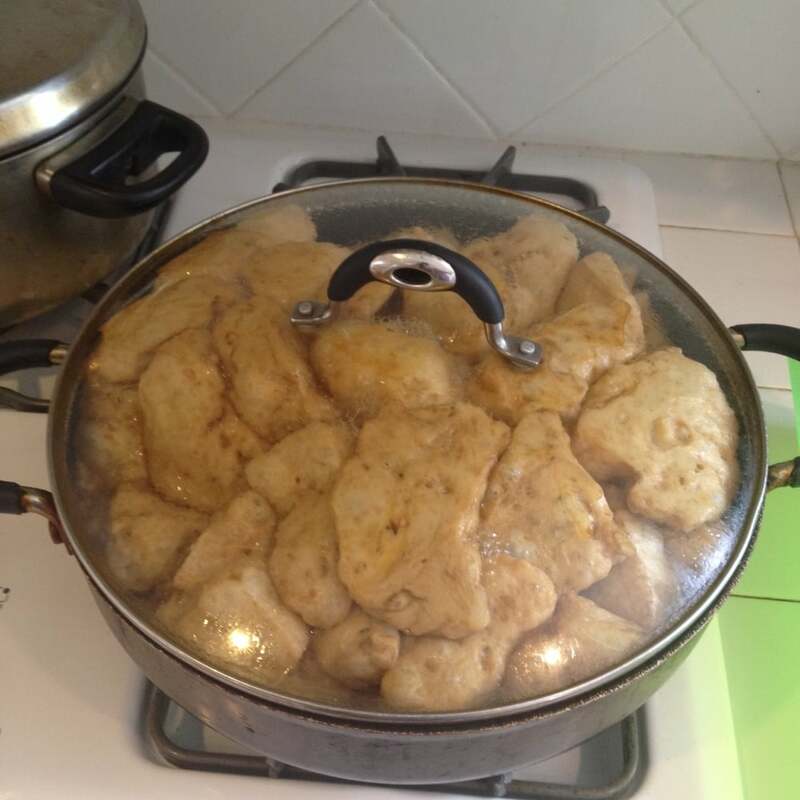 Reduce heat to medium or medium - low and let simmer for 1 hour, keeping covered throughout the process. 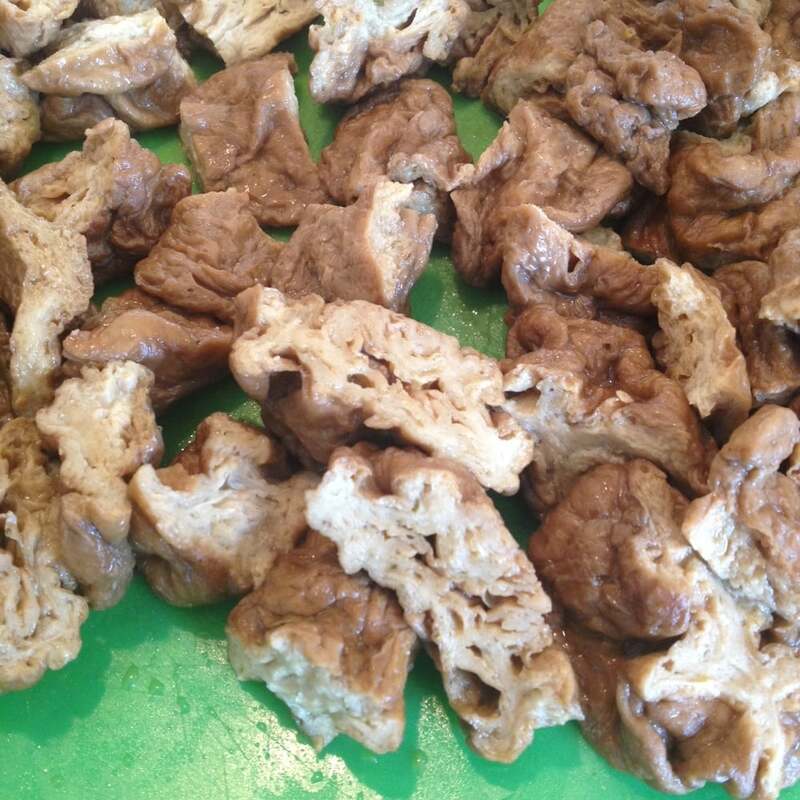 Be sure to check every few minutes and use a spoon to "pat down" the seitan pieces when they "fluff up." Also make sure that no pieces are sticking to the bottom or sides of the pan. Step 8: After about an hour, there should be very little liquid left in the pan. 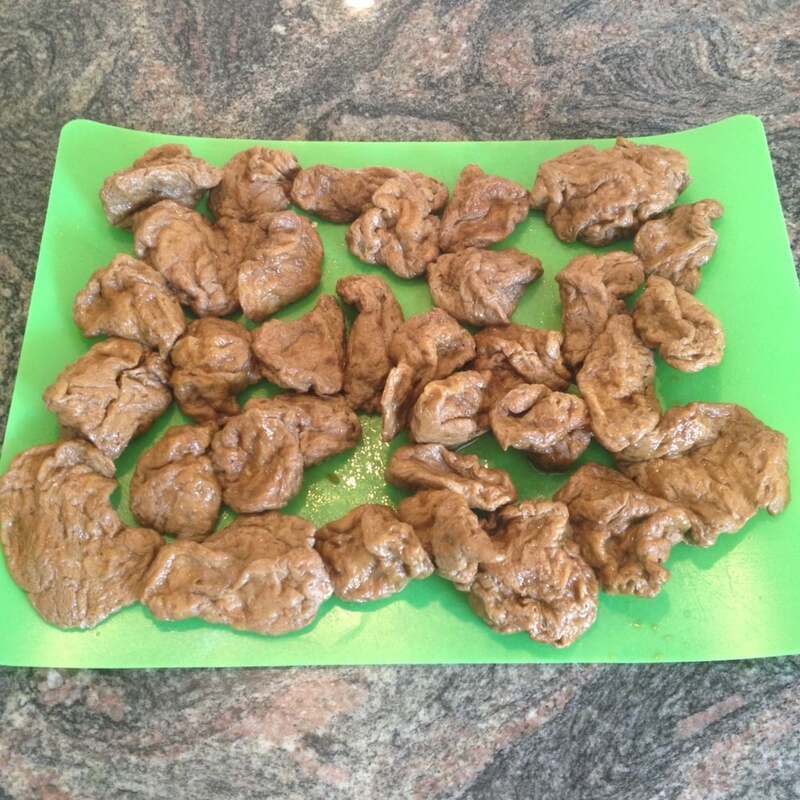 Remove the seitan pieces and let them drain and cool. After cooling, squeeze out excess liquid. Step 9: Your seitan is now ready to use! Cut into smaller pieces if desired depending upon the recipe. The last image shows how it looks when cut. Notice the fibrous interior which is perfect for soaking up your favorite sauces! These are the actual pieces I used in the Curry Seitan mentioned earlier. Remember - you can refrigerate the seitan for up to a week and use as needed. Mix all ingredients in a saucepan. Simmer slowly for 45 minutes, stirring every 5 - 10 minutes to avoid burning. The sauce will darken during the cooking process. It can be used immediately or stored for up to two weeks in the refrigerator. Step 1: Sauté the onions in a large pan or skillet until the onions are soft (about 2 min). Add the seitan. Step 2: Add enough BBQ sauce to cover the seitan. Reduce the heat and let simmer about 5 - 7 min, stirring occasionally. Step 3: After the seitan is tender and well marinated with the sauce, turn up the heat to "high" and quickly stir-fry the seitan. This will sear the sauce onto each piece and give it a more crispy texture and an authentic BBQ look. Let the seitan cool. It is now ready to eat or add to a sandwich, wrap or salad! For more recipes, and a Meatless Monday guide, check out our book, The Vegan System, with over 100 vegan recipes in 215 full color pages. Available in paperback and Kindle on Amazon.com or in PDF to download. Visit TheVeganSystem.com for details.